Can Black save her big group? It seems the stones are captured without a net. Or does this count as a net situation, given that the black stones aren't sticking out, and B @ a, W @ b, would be a true net. B's stones are hopeless and B must give them up. I would call this a net if b@a, w@b. But most likely those moves won't be played; these stones will probably just be dead inside of one of W's territories at the end of the game. Yes, that's what I was thinking. 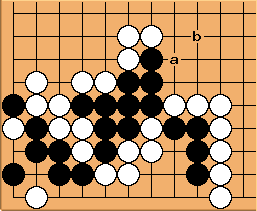 What throws me off a bit is why the whole operation is called a net after move b, when the deciding move comes two moves earlier? Because "net" is how the English-speaking go world has referred to a "geta" in Japanese terminology for many years. Geta doesn't mean net, it means sandal, and is a reference to the specific shape, which apparently at some point hundreds of years ago made somebody think about tying their sandals on. But you can say already that black "can't escape" here, and it makes sense. No need to use a technical term.